- 600TVL high resolution camera which it provides much more clear image than 420TV lines camera. Fish TV Plus 7" Color LCD Monitor and Underwater Camera Combo. See what's really going on down there! The best value in underwater viewing, Fish TV lets you enter the watery world without ever getting wet! Great for ice fishing, open water fishing from docks or boats, and a hundred other uses. 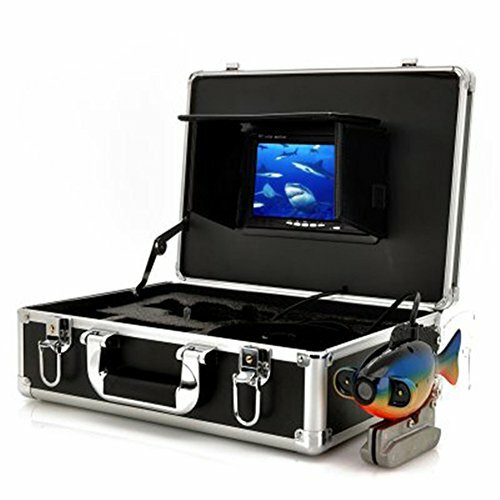 7" HD color LCD monitor for sharp views of the action; Anti-spook fish cam with built-in adjustable ultra-red lights; Adjustable contrast and brightness; Sunshield with hook-and-loop attachment for use on bright days; 20M cable; Includes 12V battery, power cord, charger, and the case to carry it all in. If you have any questions about this product by Ennio, contact us by completing and submitting the form below. If you are looking for a specif part number, please include it with your message.